Spectacular Hot Air Balloon ride! Complementary transfer from/to selected Gold Coast hotels included. If your hotel is not on the Complementary Transfer list or outside of Gold Coast, please make your own way to Nerang Fair Shopping Centre (74/98 Beaudesert Nerang Rd, Nerang QLD 4211) or Canungra Information Centre (12-14 Kidston St, Canungra QLD 4275). There are free parking and easy to locate. Meeting time will be advised on your confirmation email. Tour Duration 03:50 - 10:30 All times are approximate only, including transfers from/to hotels. Please be advised you are required to contact the service supplier 24 hours prior to the travel date during business hours to reconfirm your booking, pick up location and time, and departure time with your confirmation number. Please adjust your travel plan according to the details given by The Service Provider at time of reconfirming. Please wait in the lobby/reception of your hotel. Your driver will come in and collect you so you are not waiting outside in the early hours of the morning. Hot Air Ballooning is very weather dependent so it is important that you are ready to leave when your driver arrives or you will miss your flight. ● Dress casual outdoor layered clothing. White clothing not recommended. The Operator recommends that disabled persons seek medical advice before participating in a balloon flight. For safety reasons, certain disabled persons is prohibited from flying by Civil Aviation Safety Authority. 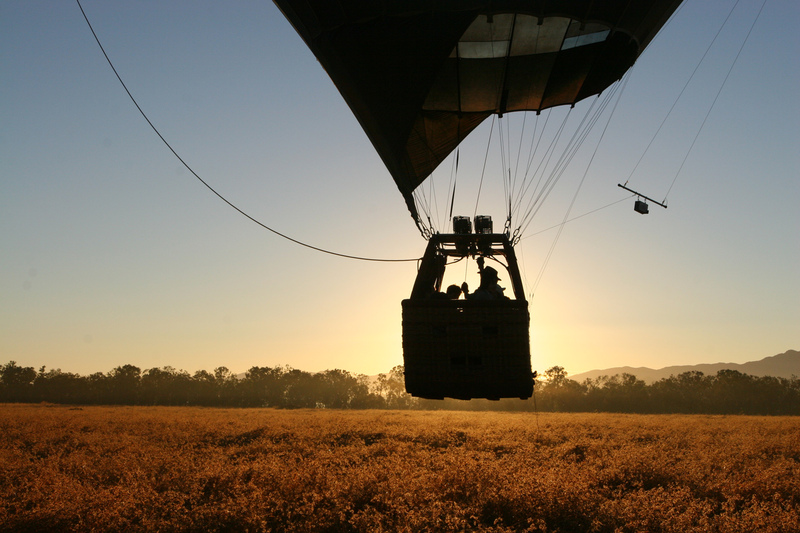 Passenger must be able to climb in and out of the basket unaided in order to participate in the balloon flight. Disabled Passengers participating in the balloon flight do so at their own risk and the Operator accepts no liability for any damages or injury caused. The Operator does not recommend pregnant persons to fly in a hot air balloon and will not carry passengers who are pregnant. Passengers who suspect they may be pregnant should check with their doctors before travelling. The Operator will not carry passengers who have participated in a scuba dive the night before their balloon flight. Passengers who dived during the day before the balloon flight should check with a qualified dive master as to the safety of the passenger in participating the balloon flight. The Operator usually does not fly above 4,500 feet altitude and most flights are around 2,500 feet altitude. Passengers diving the day before travel who participate in the balloon journey do so at their own risk and the Operator accepts no liability for any damage or injury caused. The pilot in charge of the balloon has the absolute discretion in deciding whether a passenger will fly or not. Such decisions are made in the best interest of the safety of the passengers and crew and the Operator accepts no liability for any inconvenience or damage caused. No refund will be given to those who was refused to board by the Pilot. Children must be a minimum of THREE years old to travel on the balloon flight and children up to the age of TWELVE years old must be accompanied by a responsible adult on the balloon flight. Children aged THIRTEEN to SEVENTEEN years old can travel on the balloon flight by themselves, but must be accompanied by a responsible adult for the rest of the tour including bus transfers. Children less than THREE years old may travel with their parents on the tour, but must remain on the ground in the company of at least one parent while the other parent takes the balloon flight and in this situation the parents have the option to fly on successive balloon flights when available. Adult prices will apply from FIFTEEN (15) years old. Please also note, for children who are taking the flight, they are also required to be able to climb into and out of the basket unaided and stand for the duration of the flight. If they are not taller than the basket which is 1.2 meters from ground, they can look through the foot holes which are used as stepping ladder when climb into the basket. Our Top Selling Flight! Enjoy your balloon ride, includes door to door transfers and a fantastic morning with Hot Air. 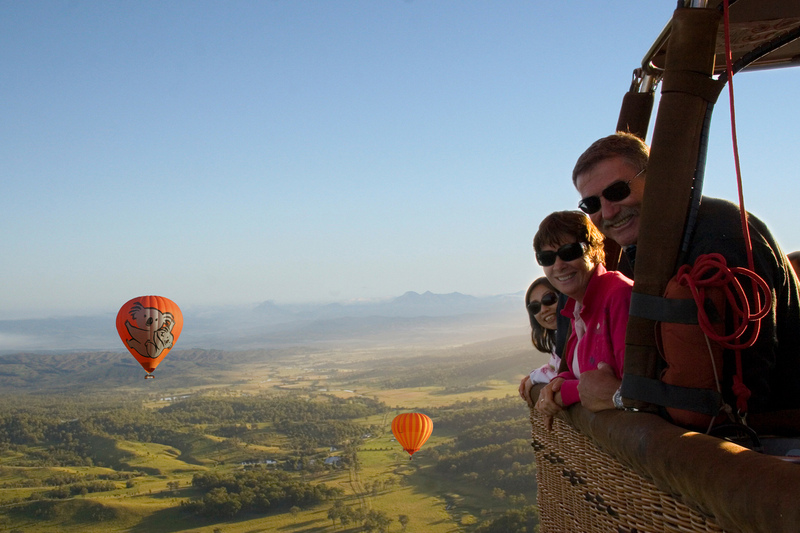 A Hot Air Balloon ride is definitely one of the Top 3 Things to Do on a visit to Gold Coast. A spectacular balloon inflation display is just the start of your morning ballooning. Meet friendly and fun crew, float up to watch the sun rise over the rolling hills of the majestic Gold Coast hinterland, enjoy sweeping views of Tamborine Mountain, Lamington National Park and to the east see the shimmering tall towers of the Gold Coast skyline.The Hinterland is specially chosen location providing the opportunity to fly higher than coastal flights and more stable and reliable weather conditions means many more flying days per year for your pleasure. *Reference Only. Subject to change without notice. Itineraries may operate in reverse order, in a different sequence, or be swapped around to suit wind, times and conditions. Pick up from accommodation in Surfers Paradise, Broadbeach, Main Beach or meet at Nerang or Canungra. Air conditioned coach transfers to the launch site. Always a surprise, always an impressive sight. After arriving at the launch site, you will see the amazing hot air balloon inflation display. 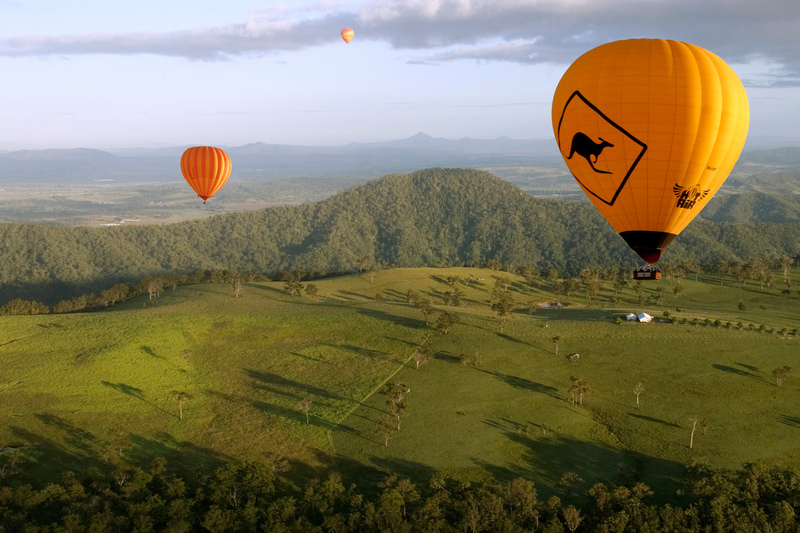 Hop onboard to experience the fun and unique sensation of your Gold Coast hot air balloon ride, floating gently above the spectacular Gold Coast Hinterland, in Queensland, Australia. With so much to see, the sensation of floating silently over this picturesque landscape at sunrise on your hot air balloon flight makes this moment such a special experience. 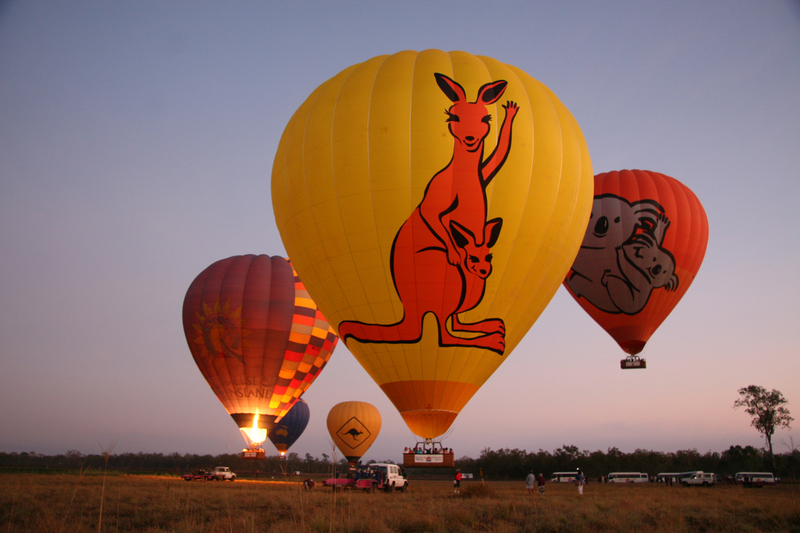 Breathe in the wide-open spaces and be amazed at the colourful spectacle of other balloons in the morning sky. A great team of experienced pilots are guiding the balloons. They have some amazing facts to share about Hot Air Ballooning. The team is a fun and highly trained crew and well practiced to maximise the enjoyment. After landing there will be pack-up games and lots of laughs. After landing there will be a short drive to O'Reilly's Grand Homestead & Boutique Vineyard at where the freshly cooked full breakfast is served. It is a real highlight of the day! Relax in the historic surroundings with a glass of champagne to cheer your morning. Air conditioned coach transfers back to your Meeting Point or Accommodation. Enjoy sweeping views of Tamborine Mountain, Lamington National Park and to the east see the shimmering tall towers of the Gold Coast skyline. With so much to see, the sensation of floating silently over this picturesque landscape at sunrise on your hot air balloon flight makes this moment such a special experience. Is there any fitness requirements for Hot Air Ballooning? It is a safety requirement that all of the travellers are able to walk from the bus across the field to the balloon basket and board the basket (1.2m in height from ground) via two foot steps built-in on the side which are used as a step ladder and stand for the duration of the flight all unassisted. How do you notify if it is cancelled due to bad weather? The Service Provider keeps a close eye on the weather conditions. If the conditions are not suitable to fly The Service Provider will call you on the number you provided at time of booking the evening before. Please make sure your contact details are advised and your phone is always switched on. The Service Provider goes on a no news is good news policy, so if you hear nothing then the flight will be going ahead as planned. Hot Air ballooning can be very weather dependent and the experienced pilots will keep a very close eye on the conditions leading up to your flight. If the weather conditions do not permit to take off The Service Provider will advise you the evening before you travel. The Service Provider will then offer you an alternative date to travel or a refund. If you wish to make any changes to your booking please advise us 7 days or more prior to you departure to be able to make changes with no penalty. How many people in a balloon? The number of guests in each balloon varies daily pending on the loading and conditions, there will be other guests on board the flight with you. The largest commercial balloons hold up to 24 passengers. There is no weight limit for passengers in the balloons. If a passenger is 100kg or more please advise upon booking as this will assist The Service Provider with the correct placement in the basket. Please be aware that all passengers are required to climb into and out of the 1.2m basket (with two footholds to use like a ladder) unaided and stand for the duration of the flight. If I am hungry before breakfast, can I eat a snack in the balloon basket? It is not allowed to consume any food or drink within the balloon basket. You are allowed to bring snacks to eat on the ground to ensure that you have energy for the rest of the day. Where is the launch spot in Gold Coast? Can I meet you there? The quick answer is no you cant drive your own vehicle to watch us take off at our launch site. As we are entering Private properties, with specific permissions, we have a responsibility to know who is under our control and who is not, also those people travelling with us officially are covered by our Insurance on behalf of the property as a requirement. However, you can drive to one of the meeting points to join the bus pick up if none of our hotel pick up points suits you. How high do hot air balloons on the Gold Coast go? The height the balloon flies depends on the air temperatures and wind patterns on the day. On average balloon flights departing in the Gold Coast Hinterland fly at approximately 3000 to 5000 ft. From this height you will be able to view a patchwork of mountains, valleys, Australian bushland and on some days see through to the coastline and skyscrapers in the distance. On the way down keep your eye out for local wildlife hopping by! Is the 60 minute flight at Gold Coast two flights or just one? The extended flight at Gold Coast will be one continuous flight for approximately 60 minutes flight time. When is the scheduled time to be back at the hotel? Our drop off times back to your hotel will be approximately 10.30am-11am. Due to city traffic delays we would recommend scheduling all further tours and plans after 12 noon. Is it possible to be picked up from our home address? Return transfers are available from most hotels and serviced apartments in Surfers Paradise down to The Star Casino in Broadbeach. We don't offer pick ups from residential addresses, which includes all Airbnb accommodations. If you are staying at a residential address, please meet us at one of our meeting points or choose a hotel that is most convenient to you and make your own way to there to be picked up. How long is the coach transfer to the launch site? Does the ticket price includes the tax or not?